Each Particle represents a hypothesis about the robot's 2D position and heading. Definition at line 13 of file LocalizationParticle.h. X position of robot in the world. Y position of robot in the world. Orientation of robot in world. Definition at line 20 of file LocalizationParticle.h. Definition at line 23 of file LocalizationParticle.h. Definition at line 26 of file LocalizationParticle.h. Definition at line 29 of file LocalizationParticle.h. 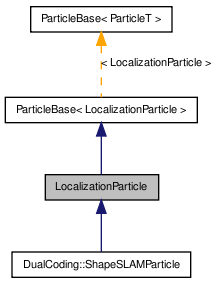 Definition at line 17 of file LocalizationParticle.h. Referenced by DualCoding::ShapeBasedParticleFilter::computeVariance(), LocalShapeEvaluator::evaluateWorkhorse(), operator<<(), projectShapeToCamera(), sumSqErr(), and DualCoding::ShapeBasedParticleFilter::synchEstimateToAgent(). Definition at line 15 of file LocalizationParticle.h. Definition at line 16 of file LocalizationParticle.h.